"Plato was initiated into the 'Greater Mysteries' at the age of 49. The initiation took place in one of the subterranean halls of the Great Pyramid in Egypt. The ISIAC TABLE formed the altar, before which the Divine Plato stood and received that which was always his, but which the ceremony of the Mysteries enkindled and brought from its dormant state. With this ascent, after three days in the Great Hall, he was received by the Hierophant of the Pyramid (the Hierophant was seen only by those who had passed the three days, the three degrees, the three dimensions) and given verbally the Highest Esoteric Teachings, each accompanied with Its appropriate Symbol. After a further three months' sojourn in the halls of the Pyramid, the Initiate Plato was sent out into the world to do the work of the Great Order, as Pythagoras and Orpheus had been before him." Before the sacking of Rome in 1527 there is no historical mention of the Mensa Isiaca, (Tablet of Isis). At that time the Tablet came into the possession of a certain locksmith or ironworker, who sold it at an exorbitant price to Cardinal Bembo, a celebrated antiquary, historiographer of the Republic of Venice, and afterwards librarian of St. Mark's. After his death in 1547 the Isiac Tablet was acquired by the House of Mantua, in whose museum it remained until 1630, when troops of Ferdinand II captured the city of Mantua. Several early writers on the subject have assumed that the Tablet was demolished by the ignorant soldiery for the silver it contained. The assumption, however, was erroneous. The Tablet fell into the hands of Cardinal Pava, who presented it to the Duke of Savoy, who in turn presented it to the King of Sardinia. When the French conquered Italy in 1797 the Tablet was carried to Paris. In 1809, Alexandre Lenoir, writing of the Mensa Isiaca, said it was on exhibition at the Bibliothèque Nationale. Upon the establishment of peace between the two countries it was returned to Italy. In his Guide to Northern Italy, Karl Baedeker describes the Mensa Isiaca as being in the center of Gallery 2 in the Museum of Antiquities at Turin. Those familiar with the fundamental principles of Hermetic philosophy will recognize in the Mensa Isiaca the key to Chaldean, Egyptian, and Greek theology. In his Antiquities, the learned Benedictine, Father Montfaucon, admits his inability to cope with the intricacies of its symbolism. He therefore doubts that the emblems upon the Tablet possess any significance worthy of consideration and ridicules Kircher, declaring him to be more obscure than the Tablet itself. Laurentius Pignorius reproduced the Tablet in connection with a descriptive essay in 1605, but his timidly advanced explanations demonstrated his ignorance concerning the actual interpretation of the figures. In his dipus Ægyptiacus, published in 1654, Kircher attacked the problem with characteristic avidity. Being peculiarly qualified for such a task by years of research in matters pertaining to the secret doctrines of antiquity, and with the assistance of a group of eminent scholars, Kircher accomplished much towards an exposition of the mysteries of the Tablet. The master secret, however, eluded even him, as Eliphas Levi has shrewdly noted in his History of Magic. "The learned Jesuit, " writes Levi, "divined that it contained the hieroglyphic key to sacred alphabets, though he was unable to develop the explanation. It is divided into three equal compartments; above are the twelve houses of heaven and below are the corresponding distributions of labor [work periods] throughout the year, while in the middle place are twenty-one sacred signs answering to the letters of the alphabet. In the midst of all is a seated figure of the pantomorphic IYNX, emblem of universal being and corresponding as such to the Hebrew Yod, or to that unique letter from which all the other letters were formed. The IYNX is encircled by the Ophite triad, answering to the Three Mother Letters of the Egyptian and Hebrew alphabets. On the right are the Ibimorphic and Serapian triads; on the left are those of Nepthys and Hecate, representing active and passive, fixed and volatile, fructifying fire and generating water. Each pair of triads in conjunction with the center produces a septenary, and a septenary is contained in the center. The three septenaries furnish the absolute number of the three worlds, as well as the complete number of primitive letters, to which a complementary sign is added, like zero to the nine numerals." Levi's hint may be construed to mean that the twenty-one figures in the center section of the Table represent the twenty-one major trumps of the Tarot cards. If this be so, is not the zero card, cause of so much controversy, the nameless crown of the Supreme Mind, the crown being symbolized by the hidden triad in the upper part of the throne in the center of the Table? Might not the first emanation of this Supreme Mind be well symbolized by a juggler or magician with the symbols of the four lower worlds spread out on a table before him: the rod, the sword, the cup, and the coin? Thus considered, the zero card belongs nowhere among the others but is in fact the fourth dimensional point from which they all emanated and consequently is broken up into the twenty-one cards (letters) which, when gathered together, produce the zero. The cipher appearing upon this card would substantiate this interpretation, for the cipher, or circle, is emblematic of the superior sphere from which issue the lower worlds, powers, and letters. "The diagram of Levi, by which he explains the mystery of the Tablet, shows the Upper Region divided into the four seasons of the year, each with three signs of the Zodiac, and he has added the four-lettered sacred name, the Tetragrammaton, assigning Jod to Aquarius, that is Canopus, He to Taurus, that is Apis, Vau to Leo, that is Momphta, and He final to Typhon. Note the Cherubic parallel--Man, Bull, Lion and Eagle. The fourth form is found either as Scorpion or Eagle depending upon the Occult good or evil intention: in the Demotic Zodiac, the Snake replaces the Scorpion. "The Lower Region he ascribes to the twelve simple Hebrew letters, associating them with the four quarters of the horizon. Compare the Sepher Yerzirah, Cap. v., sec. 1. LEVI'S KEY TO THE BEMBINE TABLE. From Levi's History of Magic. The essay published in French by Alexandre Lenoir in 1809, while curious and original, contains little real information on the Tablet, which the author seeks to prove was an Egyptian calendar or astrological chart. As both Montfaucon and Lenoir--in fact all writers on the subject since 1651--either have based their work upon that of Kircher or have been influenced considerably by him, a careful translation has been made of the latter's original article (eighty pages of seventeenth century Latin). 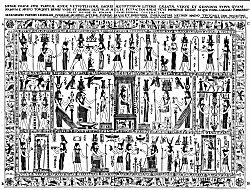 The double-page plate at the beginning of this chapter is a faithful reproduction made by Kircher from the engraving in the Museum of Hieroglyphics. The small letters and numbers used to designate the figures were added by him to clarify his commentary and will be used for the same purpose in this work. Like nearly all religious and philosophical antiquities, the Bembine Table of Isis has been the subject of much controversy. In a footnote, A. E. Waite--unable to differentiate between the true and the purported nature or origin of the Tablet--echoes the sentiments of J.G. Wilkinson, another eminent exotericus: "The original [Table] is exceedingly late and is roughly termed a forgery." On the other hand, Eduard Winkelmann, a man of profound learning, defends the genuineness and antiquity of the Tablet. A sincere consideration of the Mensa Isiaca discloses one fact of paramount importance: that although whoever fashioned the Table was not necessarily an Egyptian, he was an initiate of the highest order, conversant with the most arcane tenets of Hermetic esotericism. 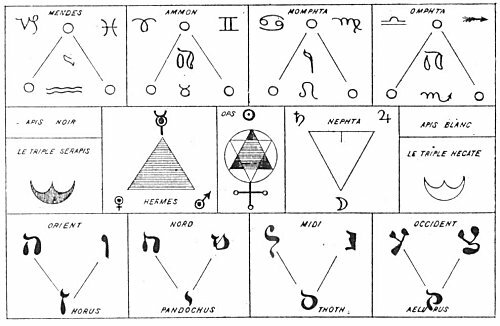 The following necessarily brief elucidation of the Bembine Table is based upon a digest of the writings of Kircher supplemented by other information gleaned by the present author from the mystical writings of the Chaldeans, Hebrews, Egyptians, and Greeks. The temples of the Egyptians were so designed that the arrangement of chambers, decorations, and utensils was all of symbolic significance, as shown by the hieroglyphics that covered them. Beside the altar, which usually was in the center of each room, was the cistern of Nile water which flowed in and out through unseen pipes. Here also were images of the gods in concatenated series, accompanied by magical inscriptions. In these temples, by use of symbols and hieroglyphics, neophytes were instructed in the secrets of the sacerdotal caste. The Tablet of Isis was originally a table or altar, and its emblems were part of the mysteries explained by priests. Tables were dedicated to the various gods and goddesses; in this case Isis was so honored. The substances from which the tables were made differed according to the relative dignities of the deities. The tables consecrated to Jupiter and Apollo were of gold; those to Diana, Venus, and Juno were of silver; those to the other superior gods, of marble; those to the lesser divinities, of wood. Tables were also made of metals corresponding to the planets governed by the various celestials. As food for the body is spread on a banquet table, so on these sacred altars were spread the symbols which, when understood, feed the invisible nature of man. In his introduction to the Table, Kircher summarizes its symbolism thus: "It teaches, in the first place, the whole constitution of the threefold world--archetypal, intellectual, and sensible. The Supreme Divinity is shown moving from the center to the circumference of a universe made up of both sensible and inanimate things, all of which are animated and agitated by the one supreme power which they call the Father Mind and represented by a threefold symbol. Here also are shown three triads from the Supreme One, each manifesting one attribute of the first Trimurti. These triads are called the Foundation, or the base of all things. In the Table is also set forth the arrangement and distribution of those divine creatures that aid the Father Mind in the control of the universe. Here [in the upper panel] are to be seen the Governors of the worlds, each with its fiery, ethereal, and material insignia. Here also [in the lower panel] are the Fathers of Fountains, whose duty it is to care for and preserve the principles of all things and sustain the inviolable laws of Nature. Here are the gods of the spheres and also those who wander from place to place, laboring with all substances and forms (Zonia and Azonia), grouped together as figures of both sexes, with their faces turned to their superior deity." 1. P, S, V--Mendesian Triad. 2. X, Z, A--Ammonian Triad. 3. B, C, D--Momphtæan Triad. 4. F, G, H-Omphtæan Triad. 1. G, I, K--Isiac Triad. 2. L, M, N--Hecatine Triad. 3. O, Q, R--Ibimorphous Triad. 4. V, S, W--Ophionic Triad. 5. X, Y, Z--Nephtæan Triad. 6. ζ, η, θ--Serapæan Triad. 7. γ, δ (not shown), ε--Osirian Triad. 1. λ, Μ, Ν--Horæan Triad. 2. ξ, Ο, Σ--Pandochæan Triad. 3. Τ, Φ, Χ--Thaustic Triad. 4. Ψ, F, Η--Æluristic Triad. Of these fifteen triads Kircher writes: "The figures differ from each other in eight highly important respects, i. e., according to form, position, gesture, act, raiment, headdress, staff, and, lastly, according to the hieroglyphics placed around them, whether these be flowers, shrubs, small letters or animals." These eight symbolic methods of portraying the secret powers of the figures are subtle reminders of the eight spiritual senses of cognition by means of which the Real Self in man may be comprehended. To express this spiritual truth the Buddhists used the wheel with eight spokes and raised their consciousness by means of the noble eightfold path. The ornamented border enclosing the three main panels of the Table contains many symbols consisting of birds, animals, reptiles, human beings, and composite forms. According to one reading of the Table, this border represents the four elements; the creatures are elemental beings. According to another interpretation, the border represents the archetypal spheres, and in its frieze of composite figures are the patterns of those forms which in various combinations will subsequently manifest themselves in the material world. The four flowers at the corners of the Table are those which, because their blossoms always face the sun and follow its course across the sky, are sacred emblems of that finer part of man's nature which delights in facing its Creator. According to the secret doctrine of the Chaldeans, the universe is divided into four states of being (planes or spheres): archetypal, intellectual, sidereal, and elemental. Each of these reveals the others; the superior controlling the inferior, and the inferior receiving influence from the superior. The archetypal plane was considered synonymous with the intellect of the Triune Divinity. Within this divine, incorporeal, and eternal sphere are included all the lower manifestations of life-all that is, has been, or ever shall be. Within the Kosmic Intellect all things spiritual or material exist as archetypes, or divine thought-forms, which is shown in the Table by a chain of secret similes. In the middle region of the Table appears the all-form-containing personified Spiritual Essence--the source and substance of all things. From this proceed the lower worlds as nine emanations in groups of three (the Ophionic, Ibimorphous, and Nephtæan Triads). Consider in this connection the analogy of the Qabbalistic Sephiroth, or the nine spheres issuing from Kether, the Crown. The twelve Governors of the Universe (the Mendesian, Ammonian, Momphtæan, and Omphtæan Triads)--vehicles for the distribution of the creative influences, and shown in the upper region of the Table-are directed in their activities by the Divine Mind patterns existing in the archetypal sphere, The archetypes are abstract patterns formulated in the Divine Mind and by them all the inferior activities are controlled. [paragraph continues] In the lower region of the Table are the Father Fountains (the Horæan, Pandochæan, Thaustic, and Æluristic Triads), keepers of the great gates of the universe. These distribute to the lower worlds the influences descending from the Governors shown above. In the theology of the Egyptians, goodness takes precedence and all things partake of its nature to a higher or lower degree. Goodness is sought by all. It is the Prime Cause of causes. Goodness is self-diffused and hence exists in all things, for nothing can produce that which it does not have in itself. The Table demonstrates that all is in God and God is in all; that all is in all and each is in each. In the intellectual world are invisible spiritual counterparts of the creatures which inhabit the elemental world. Therefore, the lowest exhibits the highest, the corporeal declares the intellectual, and the invisible i,. made manifest by its works. For this reason the Egyptians made images of substances existing in the inferior sensible world to serve as visible exemplars of superior and invisible powers. To the corruptible images they assigned the virtues of the incorruptible divinities, thus demonstrating arcanely that this world is but the shadow of God, the outward picture of the paradise within. All that is in the invisible archetypal sphere is revealed in the sensible corporeal world by the light of Nature. The Archetypal and Creative Mind--first through its Paternal Foundation and afterwards through secondary Gods called Intelligences--poured our the whole infinity of its powers by continuous exchange from highest to lowest. In their phallic symbolism the Egyptians used the sperm to represent the spiritual spheres, because each contains all that comes forth from it. The Chaldeans and Egyptians also held that everything which is a result dwells in the cause of itself and turns to that cause as the lotus to the sun. Accordingly, the Supreme Intellect, through its Paternal Foundation, first created light--the angelic world. Out of that light were then created the invisible hierarchies of beings which some call the stars; and out of the stars the four elements and the sensible world were formed. Thus all are in all, after their respective kinds. All visible bodies or elements are in the invisible stars or spiritual elements, and the stars are likewise in those bodies; the stars are in the angels and the angels in the stars; the angels are in God and God is in all. Therefore, all are divinely in the Divine, angelically in the angels, and corporeally in the corporeal world, and vice versa. just as the seed is the tree folded up, so the world is God unfolded. Proclus says: "Every property of divinity permeates all creation and gives itself to all inferior creatures. "One of the manifestations of the Supreme Mind is the power of reproduction according to species which it confers upon every creature of which it is the divine part. Thus souls, heavens, elements, animals, plants, and stones generate themselves each according to its pattern, but all are dependent upon the one fertilizing principle existing in the Supreme Mind. The fecundative power, though of itself a unit, manifests differently through the various substances, for in the mineral it contributes to material existence, in the plant it manifests as vitality, and in the animal as sensibility. It imparts motion to the heavenly bodies, thought to the souls of men, intellectuality to the angels, and superessentiality to God. Thus it is seen that all forms are of one substance and all life of one force, and these are co-existent in the nature of the Supreme One. 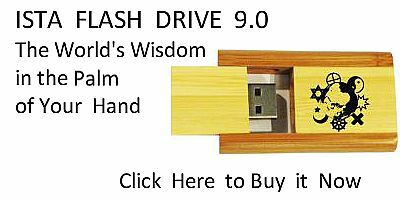 This doctrine was first expounded by Plato. His disciple, Aristotle, set it forth in these words: "We say that this Sensible World is an image of another; therefore since this world is vivid or alive, how much more, then, that other must live. * * * Yonder, therefore, above the stellar virtues, stand other heavens to be attained, like the heavens of this world; beyond them, because they are of a higher kind, brighter and vaster; nor are they distant from each Other like this one, for they are incorporeal. Yonder, too, exists an earth, not of inanimate matter, but vivid with animal life and all natural terrestrial phenomena like this one, but of other kinds and perfections. There are plants, also, and gardens, and flowing water; there are aquatic animals but of nobler species. Yonder is air and life appropriate to it, all immortal. And although the life there is analogous to ours, yet it is nobler, seeing that it is intellectual, perpetual and unalterable. For if anyone should object and ask, How in the world above do the plants, etc. above mentioned find footing, we should answer that they do not have objective existence, for they were produced by the primal Author in an absolute condition and without exteriorization. They are, therefore, in the same case as intellect and soul; they suffer no defect such as waste and corruption, since the beings yonder are full of energy, strength and joy, as living in a life sublime and being the issue of one fount and of one quality, compounded of all like sweet savors, delicate perfumes, harmonious color and sound, and other perfections. Nor do they move violently about nor intermix nor corrupt each other, but each perfectly preserves its own essential character; and they are simple and do not multiply as corporeal beings do." In the midst of the Table is a great covered throne with a seated female figure representing Isis, but here called the Pantomorphic IYNX. G. R. S. Mead defines the IYNX as "a transmitting intelligence." Others have declared it to be a symbol of Universal Being. Over the head of the goddess the throne is surmounted by a triple crown, and beneath her feet is the house of material substance. The threefold crown is here symbolic of the Triune Divinity, called by the Egyptians the Supreme Mind, and described in the Sepher ha Zohar as being "hidden and unrevealed." According to the Hebrew system of Qabbalism, the Tree of the Sephiroth was divided into two parts, the upper invisible and the lower visible. The upper consisted of three parts and the lower of seven. The three uncognizable Sephiroth were called Kether, the Crown; Chochmah, Wisdom; and Binah, Understanding. These are too abstract to permit of comprehension, whereas the lower seven spheres that came forth from them were within the grasp of human consciousness. The central panel contains seven triads of figures. These represent the lower Sephiroth, all emanating from the concealed threefold crown over the throne. WESTCOTT'S KEY TO THE BEMBINE TABLE. From Westcott's The Isiac Tablet. "Plato writes that it is needful for the philosopher to know how the seven circles beneath the first one are arranged according to the Egyptians. The first triad of fire denotes life; the second, water, over which rule the Ibimorphous divinities; and the third, air, ruled by Nephta. From the fire the heavens were created, from the water the earth, and air was the mediator between them. In the Sephira Yetzirah it is said that from the three originate the seven, i. e., the height, the depth, the East, the West, the North, and the South, and the Holy Temple in the center sustaining them all. Is not the Holy Temple in the center the great throne of the many-formed Spirit of Nature which is shown in the middle of the Tablet? What are the seven triads but the seven Powers that rule over the world? Psellus writes: 'The Egyptians worshipped the triad of faith, truth, and love; and the seven fountains: the Sun as ruler--the fountain of matter; then the fountain of the archangels; the fountain of the senses; of judgment; of lightning; of reflections; and of characters of unknown composition. They say that the highest material fountains are those of Apollo, Osiris, and Mercury--the fountains of the centers of the elements. 'Thus, they understood by the Sun as ruler the solar world; by the material archangelic, the lunar world; by the fountain of the senses, the world of Saturn; by judgment, Jupiter; by lightning, Mars; by that of the reflections, or mirrors, the world of Venus; by the fountain of characters, the world of Mercury. All these are shown by the figures in the center pane of the Tablet." The upper panel contains the twelve figures of the zodiac arranged in four triads. The center figure in each group represents one of the four fixed signs of the zodiac. S is the sign of Aquarius; Z, Taurus; C, Leo; and G, Scorpio. These are called the Fathers. In the secret teachings of the Far East these four figures--the man, the bull, the lion, and the eagle--are called the winged globes or the four Maharajahs who stand upon the corners of creation. The four cardinal signs--P, Capricorn; X, Aries; B, Cancer; F, Libra--are called the Powers. The four common signs--V, Pisces; A, Gemini; E, Virgo; H, Sagittarius--are called the Minds of the Four Lords. This explains the meaning of the winged globes of Egypt, for the four central figures--Aquarius, Taurus, Leo, and Scorpio (called by Ezekiel the Cherubim)--are the globes; the cardinal and common signs on either side are the wings. Therefore the twelve signs of the zodiac may be symbolized by four globes, each with two wings. The celestial triads are further shown by the Egyptians as a globe (the Father) from which issue a serpent (the Mind) and wings (the Power). These twelve forces are the fabricators of the world, and from them emanate the microcosm, or the mystery of the twelve sacred animals--representing in the universe the twelve parts of the world and in man the twelve parts of the human body. Anatomically, the twelve figures in the upper panel may well symbolize the twelve convolutions of the brain and the twelve figures in the lower panel the twelve zodiacal members and organs of the human body, for man is a creature formed of the twelve sacred animals with his members and organs under the direct control of the twelve governors or powers resident in the brain. A more profound interpretation is found in the correspondences between the twelve figures in the upper panel and the twelve in the lower. This furnishes a key to one of the most arcane of ancient secrets--the relationship existing between the two great zodiacs the fixed and the movable. The fixed zodiac is described as an immense dodecahedron, its twelve surfaces representing the outermost walls of abstract space. From each surface of this dodecahedron a great spiritual power, radiating inward, becomes embodied as one of the hierarchies of the movable zodiac, which is a band of circumambulating so-called fixed stars. Within this movable zodiac are posited the various planetary and elemental bodies. The relation of these two zodiacs to the subzodiacal spheres has a correlation in the respiratory system of the human body. The great fixed zodiac may be said to represent the atmosphere, the movable zodiac the lungs, and the subzodiacal worlds the body. The spiritual atmosphere containing the vivifying energies of the twelve divine powers of the great fixed zodiac is inhaled by the cosmic lungs--the movable zodiac--and distributed by them through the constitution of the twelve holy animals which are the parts and members of the material universe. The functional cycle is completed when the poisonous effluvia of the lower worlds collected by the movable zodiac are exhaled into the great fixed zodiac, there to be purified by being passed through the divine natures of its twelve eternal hierarchies. The Table as a whole is susceptible of many interpretations. If the border of the Table with its hieroglyphic figures be accepted as the spiritual source, then the throne in the center represents the physical body within which human nature is enthroned. From this point of view the entire Table becomes emblematic of the auric bodies of man, with the border as the outer extremity or shell of the auric egg. If the throne be accepted as the symbol of the spiritual sphere, the border typifies the elements, and the various panels surrounding the central one become emblematic of the worlds or planes emanating from the one divine source. If the Table be considered from a purely physical basis, the throne becomes symbolic of the generative system and the Table reveals the secret processes of embryology as applied to the formation of the material worlds. If a purely physiological and anatomical interpretation be desired, the central throne becomes the heart, the Ibimorphous Triad the mind, the Nephtæan Triad the generative system, and the surrounding hieroglyphics the various parts and members of the human body. From the evolutionary viewpoint the central gate becomes the point of both entrance and exit. Here also is set forth the process of initiation, in which the candidate after passing successfully through the various ordeals is finally brought into the presence of his own soul, which he alone is capable of unveiling. If cosmogony be the subject of consideration, the central panel represents the spiritual worlds, the upper panel the intellectual worlds, and the lower panel the material worlds. The central panel may also symbolize the nine invisible worlds, and the creature marked T the physical nature--the footstool of Isis, the Spirit of Universal Life. Considered in the light of alchemy, the central panel contains the metals and the borders the alchemical processes. The figure seated on the throne is the Universal Mercury--the "stone of the wise"; the flaming canopy of the throne above is the Divine Sulphur; and the cube of earth beneath is the elemental salt. The three triads--or the Paternal Foundation--in the central panel represent the Silent Watchers, the three invisible parts of the nature of man; the two panels on either side are the quaternary lower nature of man. In the central panel are 21 figures. This number is sacred to the sun--which consists of three great powers, each with seven attributes--and by Qabbalistic reduction 21 becomes 3, or the Great Triad. 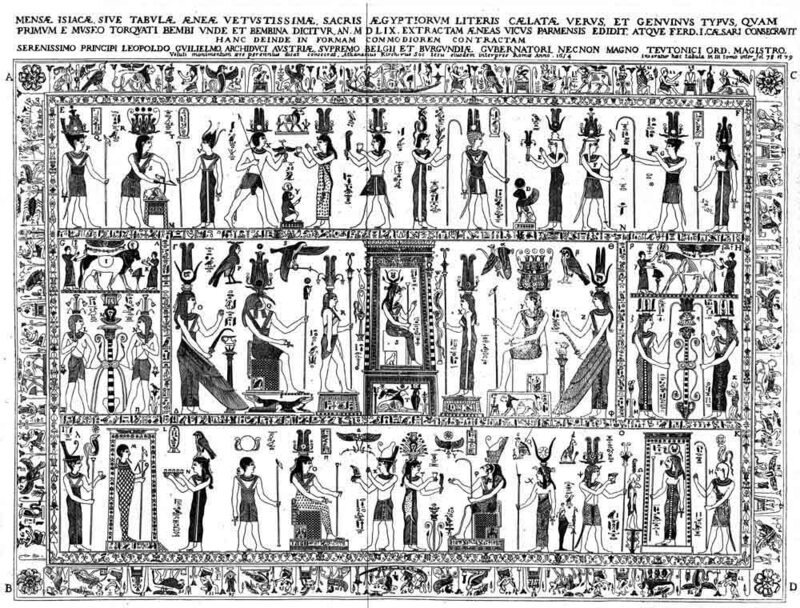 It will yet be proved that the Table of Isis is directly connected with Egyptian Gnosticism, for in a Gnostic papyrus preserved in the Bodleian Library there is a direct reference to the twelve Fathers or Paternities beneath whom are twelve Fountains. (See Egyptian Magic by S.S.D.D.) That the lower panel represents the underworld is further emphasized by the two gates--the great gate of the East and the great gate of the West--for in the Chaldean theology the sun rises and sets through gates in the underworld, where it wanders during the hours of darkness. 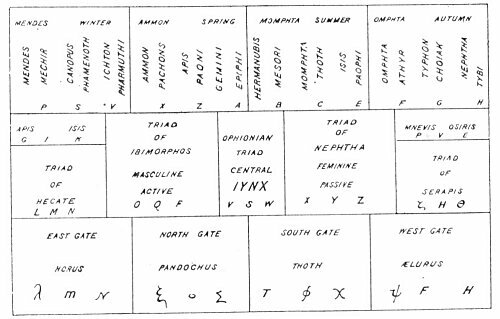 As Plato was for thirteen years under the instruction of the Magi Patheneith, Ochoaps, Sechtnouphis, and Etymon of Sebbennithis, his philosophy consequently is permeated with the Chaldean and Egyptian system of triads. The Bembine Table is a diagrammatic exposition of the so-called Platonic philosophy, for in its design is epitomized the entire theory of mystic cosmogony and generation. The most valuable guide to the interpretation of this Table is the Commentaries of Proclus on the Theology of Plato. The Chaldean Oracles of Zoroaster also contains many allusions to the theogonic principles which are demonstrated by the Table. The Theogony of Hesiod contains the most complete account of the Greek cosmogony myth. Orphic cosmogony has left its impress upon the various forms of philosophy and religion--Greek, Egyptian, and Syrian--which it contacted. Chief of the Orphic symbols was the mundane egg from which Phanes sprang into light. Thomas Taylor considers the Orphic egg to be synonymous with the mixture from bound and infinity mentioned by Plato in the Philebus. The egg is furthermore the third Intelligible Triad and the proper symbol of the Demiurgus, whose auric body is the egg of the inferior universe. Eusebius, on the authority of Porphyry, declared that the Egyptians acknowledged one intellectual Author or Creator of the world under the name of Cneph and that they worshiped him in a statue of human form and dark blue complexion, holding in his hand a girdle and a scepter, wearing on his head a royal plume, and thrusting forth an egg out of his mouth. (See An Analysis of the Egyptian Mythology) While the Bembine Table is rectangular-shaped, it signifies philosophically the Orphic egg of the universe with its contents. In the esoteric doctrines the supreme individual achievement is the breaking of the Orphic egg, which is equivalent to the return of the spirit to the Nirvana--the absolute condition--of the Oriental mystics. The New Pantheon by Samuel Boyse contains three plates showing various sections of the Bembine Table. The author, however, makes no important contribution to the knowledge of the subject. In The Mythology and Fables of the Ancients Explained from History, the Abbé Banier devotes a chapter to a consideration of the Mensa Isiaca. After reviewing the conclusions of Montfaucon, Kircher, and Pignorius, he adds: "I am of the opinion that: it was a votive table, which some prince or private person had consecrated to Isis, as an acknowledgment for some benefit which he believed she had conferred upon him."